Charles Leclerc believes Ferrari will be very competitive at this weekend's Formula 1 Chinese Grand Prix. Leclerc's hopes for a maiden GP win were dashed a fortnight ago in Bahrain, when an electrical problem caused him to lose the lead, but he hopes victory will be his in Shanghai. 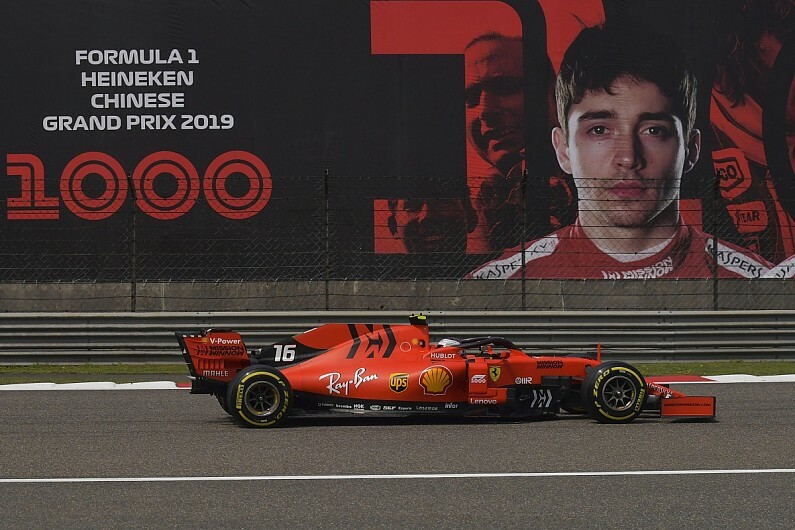 Speaking at a PR event organised by Shell in the build-up to the Chinese GP, Leclerc was optimistic about Ferrari's form at a track which features one of the longest straights on the F1 calendar, measuring 1.1km. "Hopefully we will continue our competitiveness from Bahrain. After the analysis from that race we were very quick on the straights and we want to maintain that advantage," said Leclerc. "However we need to keep working as we know the competition is working very hard too." After leading most of the Bahrain GP, Leclerc's electrical fault with his power unit forced the Ferrari to slow, and although he relinquished the lead to Hamilton, a late-race Safety Car ensured he finished third at the flag - his first podium in F1. "It was disappointing as I was very close to my first grand prix victory in Formula 1, but on the other hand, to have an issue and to still finish third is something we should be happy about. "In a season it's unusual if other teams don't have problems too, so if we can finish third every time we have an issue - then I'll be very pleased." Leclerc was speaking at an ice rink in the city of Shanghai, where he was showcasing the benefits of Shell Helix Ultra and Shell V-Power by taking part in a go-kart obstacle course, competing against Chinese world champion short track speed skater Han Tian Yu, for a PR event organised by Shell. "What happened in Bahrain is part of motorsport and it doesn't go your way sometimes," said Leclerc. "But overall the performance was there - that's the most important thing. Hopefully we can recover and take the win here in Shanghai." "Sebastian is extremely experienced, he's very talented and he's a great benchmark for me. I've definitely learnt a lot from him, but still have a lot to learn - and our relationship is very good. "Your team-mate is the first person you want to beat, but what is more important is that we are working together to improve the car. There is competition but we need to work as a team to get the most out of the package." At the end of last year it was calculated that 21% of the power unit lap time gain over the course of the 2018 season had come from the Shell fuels and lubricants - which Leclerc was keen to praise. "It's a very close partnership," he said. "Fuel and lubricants in F1 are very important for both performance and reliability and Shell are working very closely on that technical relationship with Ferrari to push the performance forward. When I was racing in the junior categories, we didn't really learn anything about fuel and lubricants as it was standardised across the grid. But now I can see the partnership between Shell and Ferrari is really working together well for both performance and reliability."